In her last year as an undergraduate student, Maria Joao Baptista was an Erasmus student in the Department of Biochemistry, Autonomous University of Madrid leaded by Prof. Antonio Sillero. In 2000, Maria Joao Baptista finished her degree in Pharmaceutical Sciences in the University of Porto. Maria Joao worked in the Immuno-hemotherapy Department, IPO, Porto, Portugal and in 2003 she concluded her MSc in Oncology presenting the dissertation entitled “IL2 action: Phenotypic Characterization of T lymphocytes and NK cells”. From 2003 to 2005, Maria Joao worked in the group of Prof. Alberto Orfao in the CIC, University of Salamanca. There, she learnt immunophenotypic diagnosis of different types of leukaemias and lymphomas and the studies of minimal residual disease. After receiving the Research Proficiency in Medicine certificate in 2005 she stared doctoral training. Maria Joao developed her PhD project under the direction of Dr. Francesc Bosch in IDIBAPS-Hospital Clinic, and later in Vall d’Hebron Research Institute, when Dr Bosch moved there. 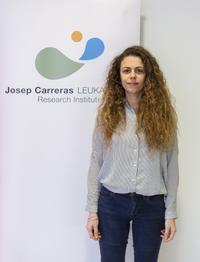 She presented her PhD thesis entitle “Molecular mechanisms of apoptosis induced by dexamethasone in Chronic Lymphocytic Leukemia” in 2012 in the University of Barcelona. She joined Dr. Tomás Navarro's group at the Trias i Pujol Institute in 2011, and since 2013 she is a postdoctoral investigator at IJC. Her current research is focused in the role of miRNAs in the lymphomagenesis of HIV-related non-Hodgkin’s lymphomas, and the correlation of genetic and epigenetic profiles with the clinical-biological features and the prognosis of aggressive lymphomas.